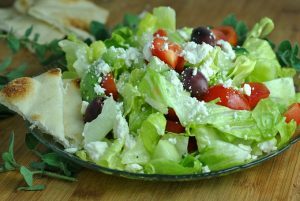 When I was grocery shopping on Sunday, I circled several items on my list that I preferred to pick up at local farm stands. There’s a great stand right by my work and I had every intention of stopping before heading home yesterday. However, I guess I was in a hurry to get home because I was on the highway heading away from work and the farm stand when I saw the note to myself reading, “tomatoes” sitting in the passenger seat. So much good it did me sitting there, huh? I did the next best thing…I drove random country roads close to home on the hunt for tomatoes. Hey, it seemed like a good idea at the time. The first produce stand I spotted was right over a hill so I had to slam on my breaks and nearly pull into the field to get off the road. The car behind me…not so happy with me. It ends up they had berries and peaches…no tomatoes. Off I went. There was a produce sign on a corner a few too many miles further down the road, so I headed that way and picked up my tomatoes. Beautiful tomatoes. I headed home and had lost 30 minutes of valuable evening time. When I walked in the door, I found a note scribbled on an envelope that read, “At beach 5:30”. Apparently, I got left for the beach. I quickly threw on running clothes and struggled through 3 1/2 miles in the August-like heat before I talked myself out of a workout and into the relaxing beach instead. I said I wanted a good sweat session out of my workout…and that I achieved. By the time I returned home, it was 7pm and I had talked myself out of dinner. The tomatoes would wait for another night. Knowing my luck, my CSA delivery today will include about 152 tomatoes. It included cabbage several weeks in a row…so much cabbage that I had no idea what to do with all of it all. And then I saw this recipe. While the purple cabbage adds a visual wow-factor, the green cabbage worked just as well. This recipe was positively delicious, says the person who could take-or-leave red meat. Flank steak is incredibly lean and this marinade is packed with flavor (and salt 🙁 ), but not calories. You’ll love it. 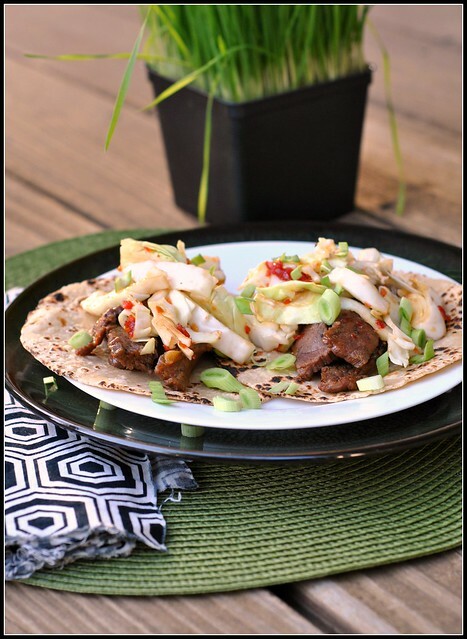 Spicy, bold flavors...flank steak just found a new calling! To make the steak marinade, combine the sugar, soy sauce, chile paste, lime juice, sesame oil, and garlic in a ziptop bag and shake well. Add the steak and turn to coat; refrigerate for 1-2 hours. Meanwhile, place the cabbage in a bowl. In a small saucepan combine the rice vinegar, soy sauce, sugar, and chile paste. Bring to a boil and then pour over top of the cabbage. Toss to coat. Allow to sit for 10-20 minutes. When steak is done marinading, heat the olive oil in a skillet over medium-high heat. Once hot, transfer the steak to the pan and cook 5-7 minutes or until cooked through, sprinkling with black pepper to season. 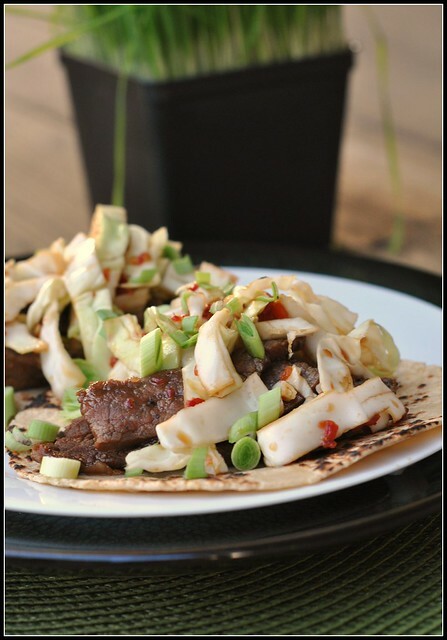 Serve steak in the corn tortillas topped with the cabbage and a sprinkle of green onions. I’m so glad you tried these and liked them. 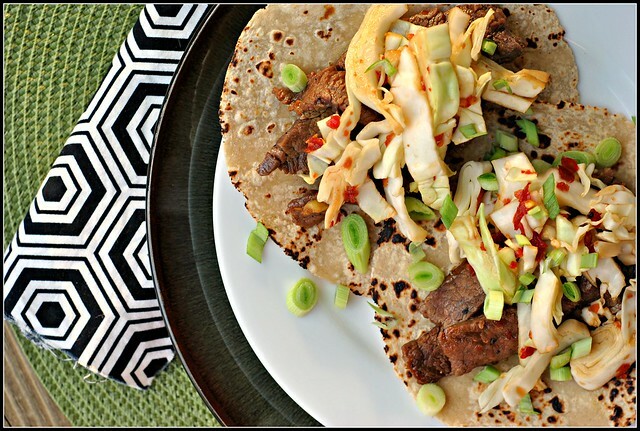 They are just a fun and delicious spin on tacos. I love the idea of this, but raw cabbage and me don’t get along too well. I think I’ll add broccoli slaw though! I love how close you are to Lake Michigan – jealous! 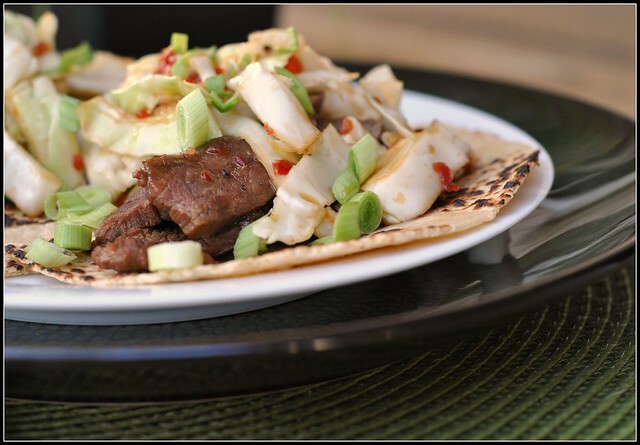 Korean Style Beef tacos are one of my favorite types of food. 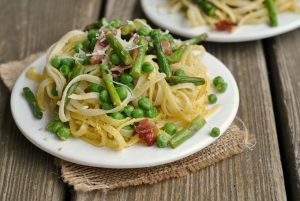 Easy to make and taste absolutely delicious! This looks delicious. I love all the flavors in here.